I was just informed that this month is Max's 60th Anniversary and they are celebrating. Everyday this month they will have sandwich of the day and that is 60% off. I got the toasted egg salad sandwich with a soup and it came to just over 5 dollars (what a deal). 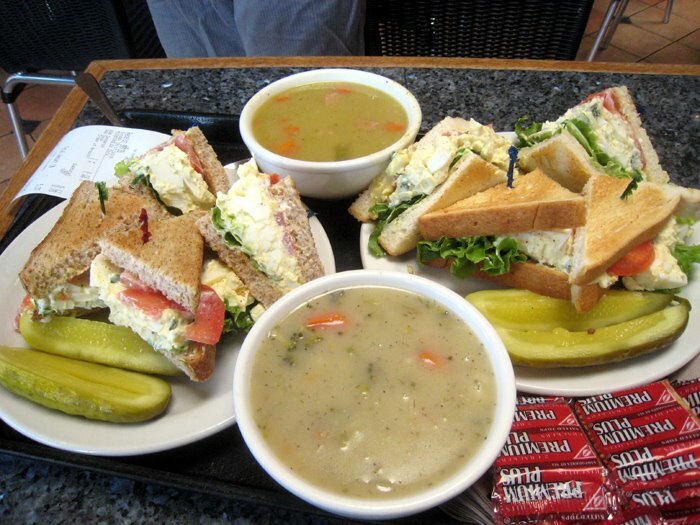 The soup was really tasty and the sandwich was cut into four pieces, just like finger food. My friends who ordered before us got their sandwich grilled and it came with cheese. Mine came with an extra pickle but it didn't come with cheese. I rather of had cheese, but oh well it was a good meal nonetheless. I love deals so I'll be there.